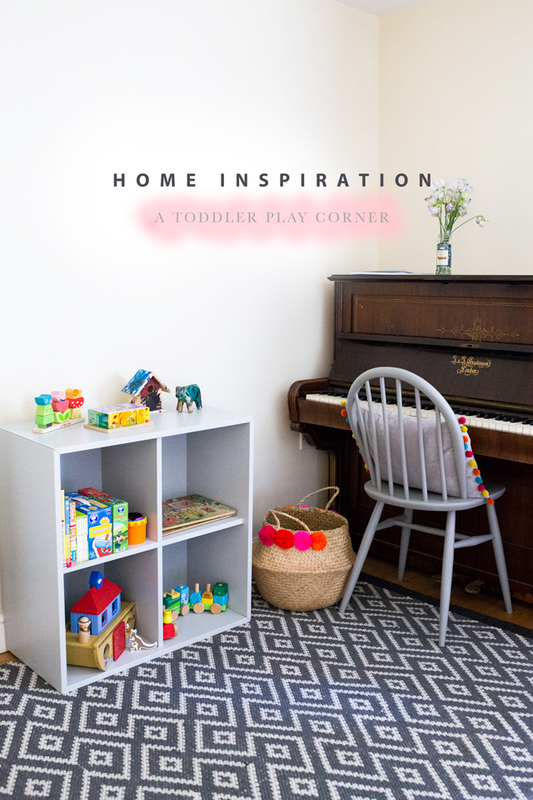 A nursery to toddler bedroom makeover! And just like that, my little girl’s baby bedroom transformed into a space perfect for the toddler that she is! It feels a fitting time to have made over Ottilie’s bedroom, whilst pregnant with our next baby. 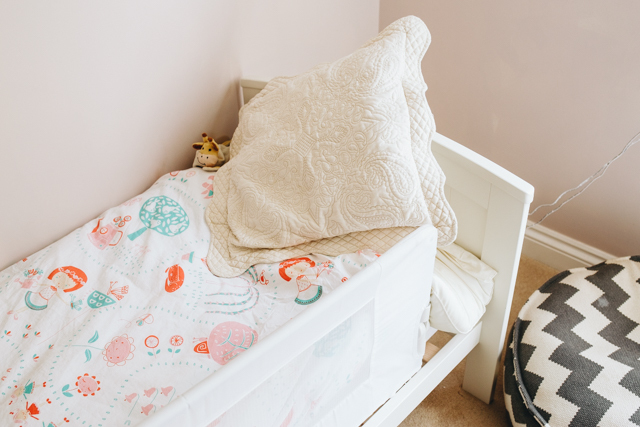 It seems to fit the natural flow of our family life- as one little bird hops the nursery-nest and flies off into the realms of big-girl beds and reading corners, the next is ready to take her place in the cot! Oh, how the time flies when you’re watching children grow. 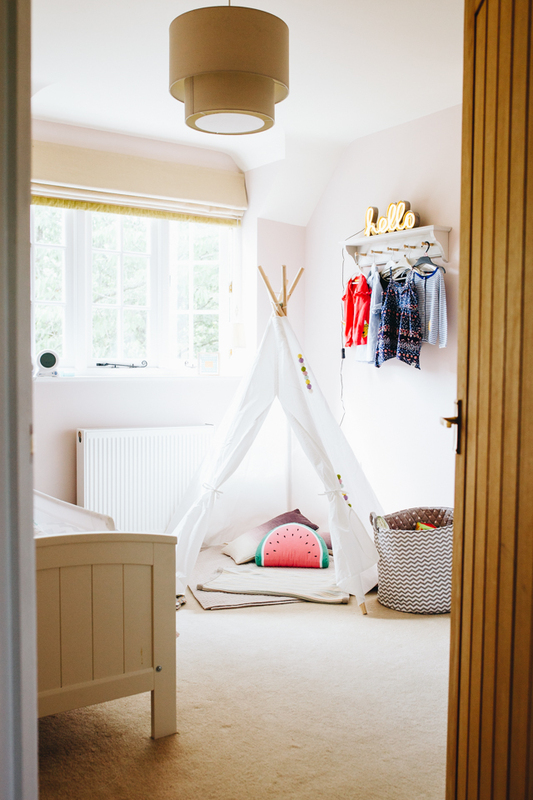 So, back on topic, today I’d like to share a few photos from the mini makeover we’ve done of Ottilie’s bedroom over the last couple of months! I’m so pleased with how the room’s come together, and Ottie loves it too! First up, walls! Jason painted the room as a surprise for Ottilie and me when we were away in France (the cutest <3), and the shade is Farrow & Ball ‘Chamomile’. I love how it’s a slightly dirty pale pink, and not a traditional ‘baby’ pink shade. 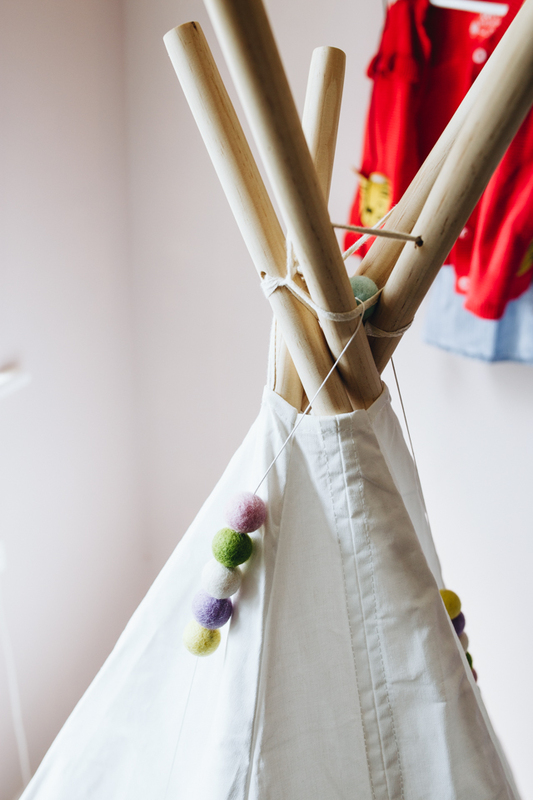 I think Ottilie’s favourite addition to the room though has been her new teepee! We’ve put it in place of the armchair that used to be in that corner, which we found just wasn’t being used since Ottilie started having bedtime milk and stories in her bed after we switched her out of her cot. And it’s been a standout hit! 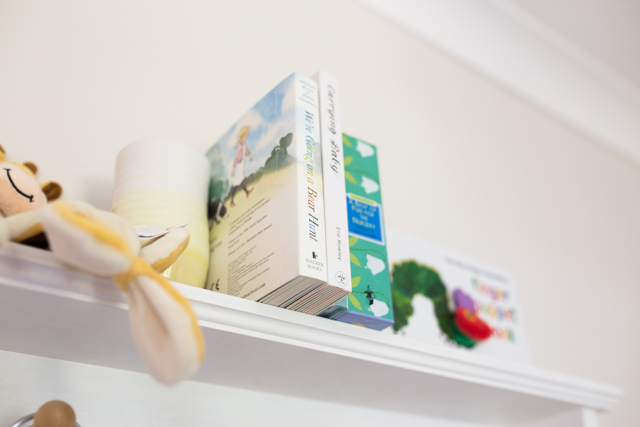 Ottie loves taking books in there to read either by herself or with us, putting her teddies and babies to ‘bed’ inside it under the blankets, or using it as a hiding spot during one of our very, VERY frequent games of Hide and Seek! It was a total bargain too, bought from Hobbycraft on recommendation from Jen! 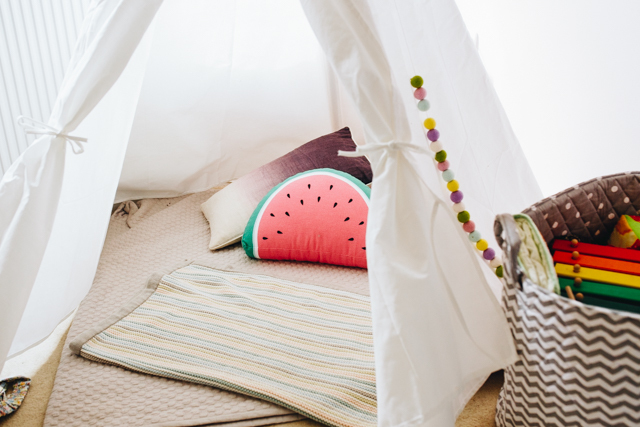 I’ve put a few cushions inside (the watermelon one Ottie picked herself from H&M, she’s obsessed with ‘walkermelon’ and so I couldn’t say no to buying it for her! 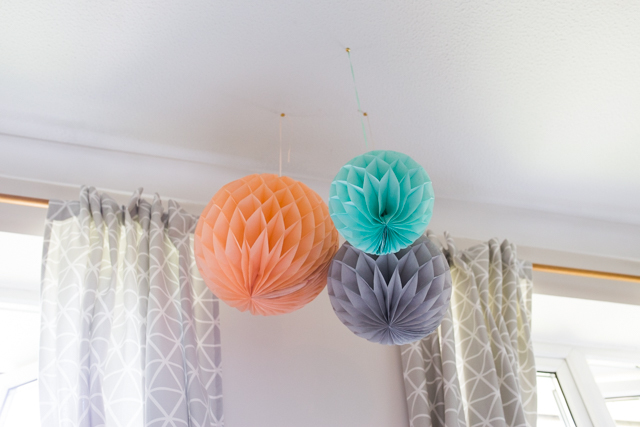 ), and also strung that sweet felt pompom garland over it too! It was Etsy find, from a shop called Nordic In Kent. A quick note on Ottilie’s bed and the cot > bed transition- I’ll be honest, there was a period when I wasn’t sure we’d made the right call. 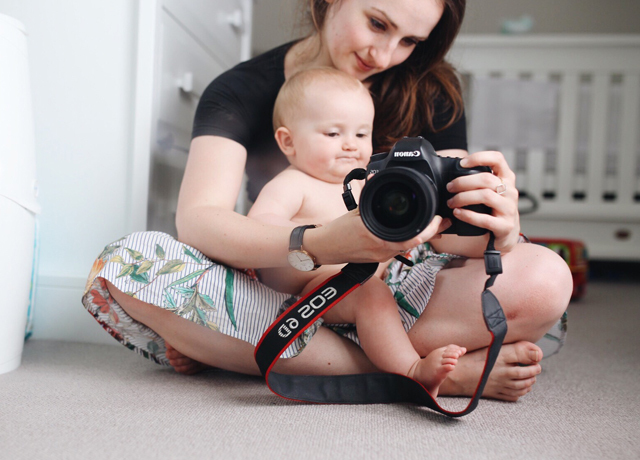 We had a LOT of nighttime wanderings and very early starts, and I was a bit worried we’d turned our toddler from an excellent sleeper into a dreadful one! But actually I think it was just a case of timing, as Ottilie’s cut two new teeth over the past few weeks since she went into her bed which has upset her sleep, and also I do distinctly remember her being an early riser last summer too. And she’s got loads better over the last few weeks- with a bit of help from the Gro Clock, she doesn’t really ever get out of bed at night anymore and we’ve pushed bedtime back to 8pm to help her sleep in slightly later in the mornings! 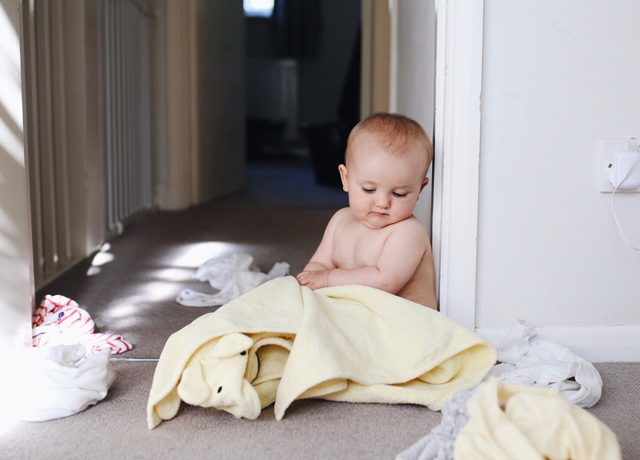 Oh, and still swearing by the Gro to Bed set for its genius integrated pillow and duvet with zippable sides, to prevent covers being kicked off in the night. Not so essential in this heatwave, but I think it’s the cleverest idea! 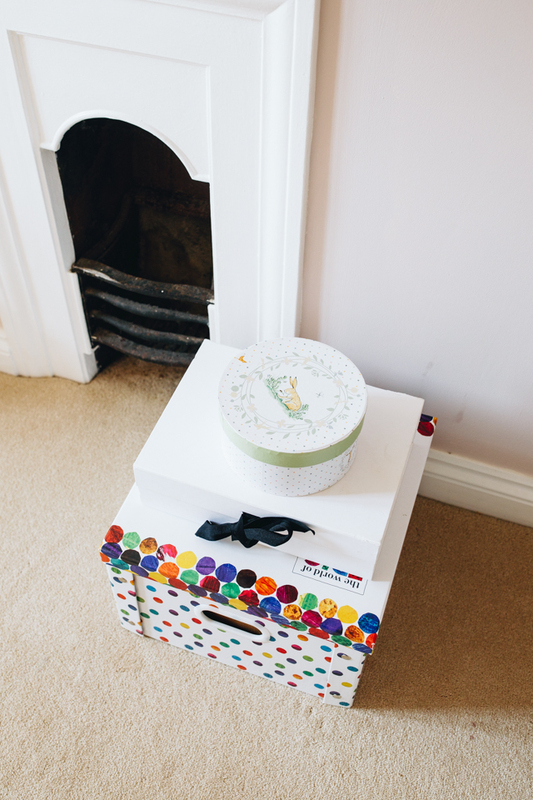 These toy storage boxes have been doing us proud for a good 18 months now I think! 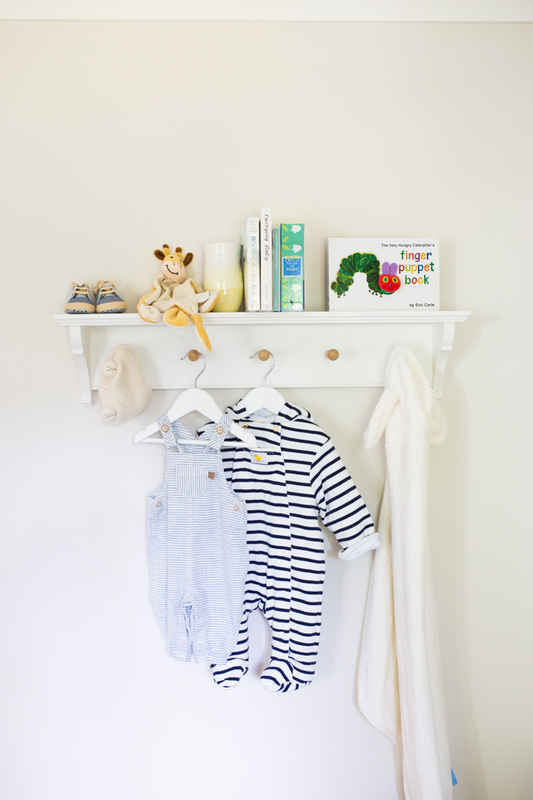 Ottie’s current favourite are all the wooden puzzles in the White Company box, which actually once contained a gift at my baby shower when I was pregnant with her! 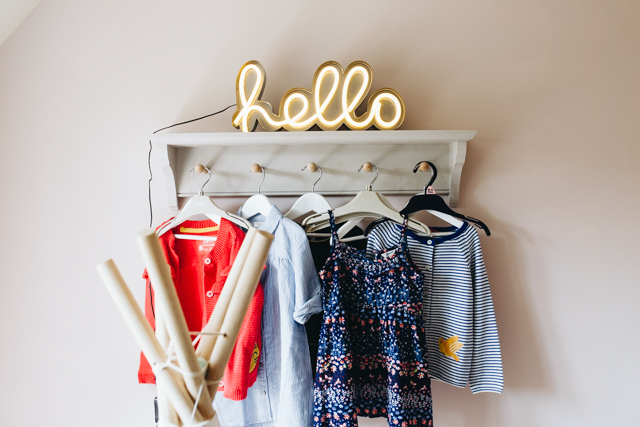 I came across this ‘hello’ faux-neon sign whilst shopping for some artwork for Ottie’s room, and I’m totally in love with it! It’s a lovely warm light just right for reading bedtime stories by, and I think it adds such a fun, modern feel to her room. 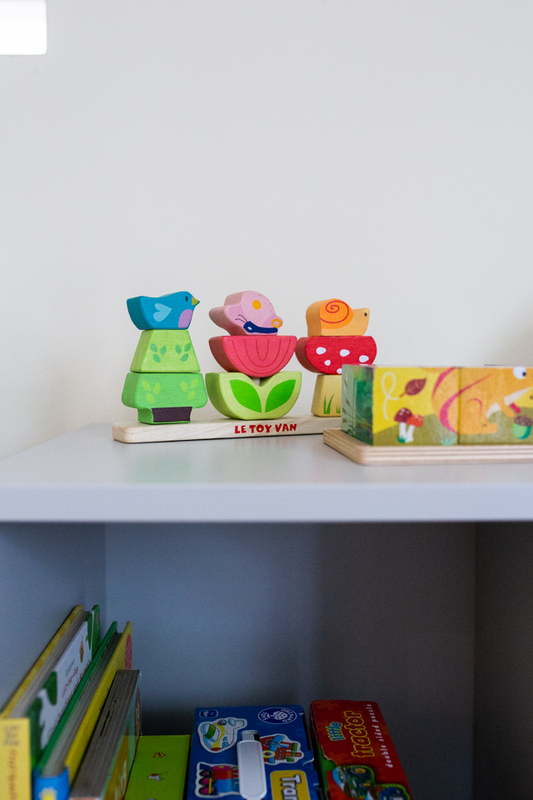 And the peg shelf has been one of my best purchases, which we’ve had since putting together the nursery in our old house before Ottie was even born! It’s another Etsy piece, though annoyingly I can’t seem to find a link for the shop online now. I’ll update here if I manage to track it down! And on the mantlepiece below is a print I’ve been meaning to put up in Ottie’s room for months on end, and figured if I waited until I was organised enough to get a frame for it I’d probably still have it carefully packed away in an envelope when she’s off to senior school! The print was an incredibly kind gift from Wendy at The Charming Press, and I just adore it. 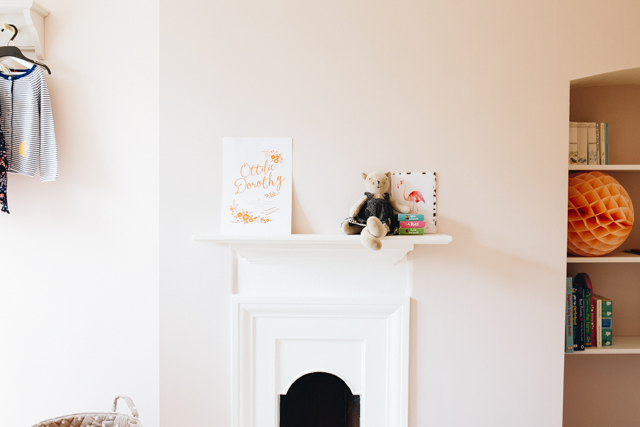 It’s personalised with the details of Ottilie’s birth, and I think it makes such a lovely addition to the room I’m going to get one done for the next baby when she or he makes an appearance later this year! I’m so, so happy with how this space has shaped up, and it feels so good to have given it all a good sort out in preparation for the baby coming as well. I’ve had a big reshuffle of Ottilie’s dresser to make space for baby clothes, and put together a big basket full of muslins, swaddles, and blankets too. So, we’re getting there! Let me know in the comments if there’s anything I’ve not linked to that you’d like a source for :) And I hope you like the room as much as we do! I thought today I’d share a little update on a new play area I’ve just made for Ottilie that so far has been a storming success! Our kitchen and dining room are adjoined to form one big space, with an eight-seater table taking up about two thirds of the space in the dining half of the room and French doors down the end of the room letting in lots of lovely natural light. 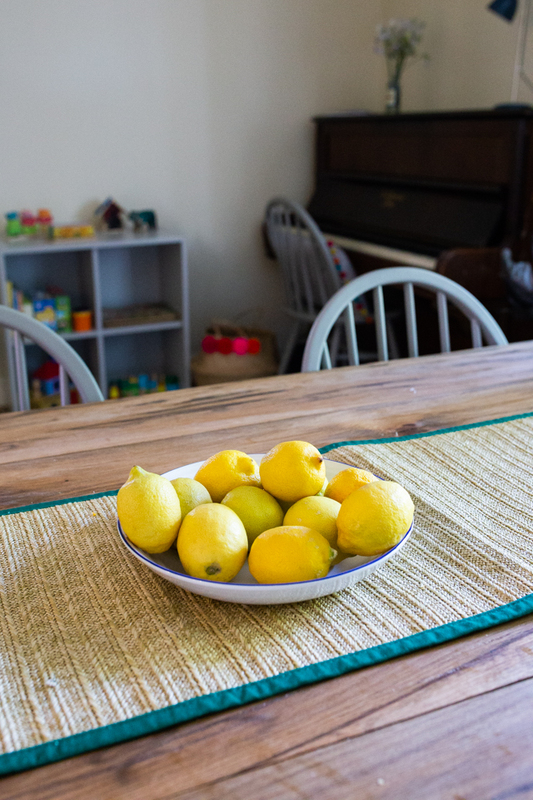 It’s one of my favourite spaces in the house, but I’ve always felt that we weren’t making the best use of the room. The other third of the dining room not taken up by the table and chairs has always been a bit of a dead area, containing just the piano, the dogs’ beds, and not a lot else! 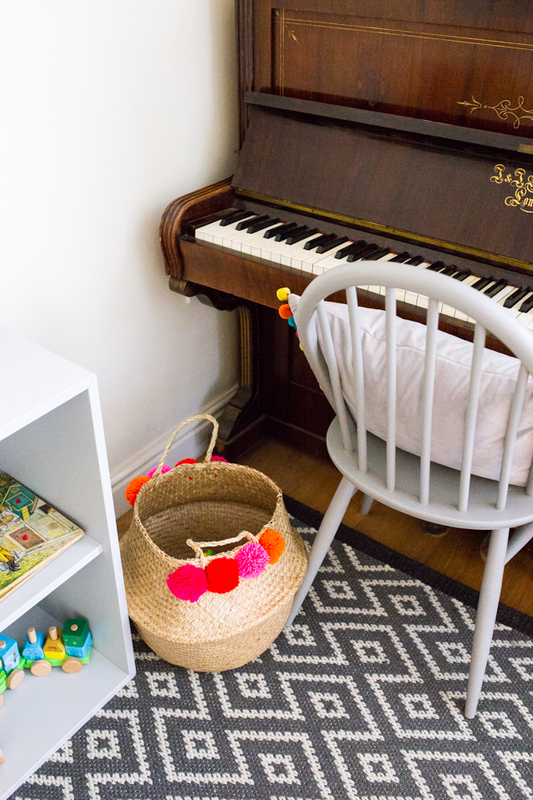 I decided it might be nice to create a little play area there for Ottilie, not only to give the room some life but also to give Ottie some on-hand distractions for when I’m cooking and preparing food. She has a tendency to cling to my legs and whinge, which makes moving round the kitchen quite tricky! Since I’m already in full nesting mode and therefore want our house made perfect as of NOW, I had everything for the play area ordered and sorted within about 3 hours of deciding it wanted doing! 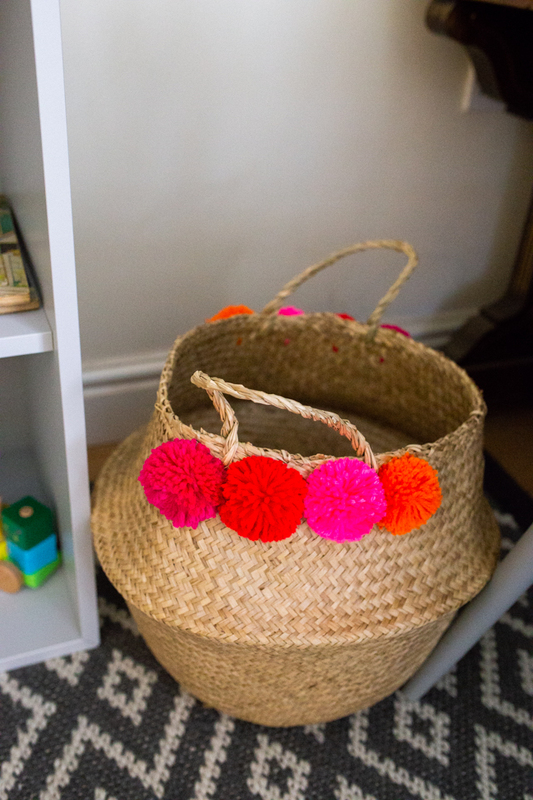 My favourite find of the whole area might just be that gorgeous pompom basket in the photo above, not least because I very nearly bought a similar one from La Redoute for £65, but found this one at an independent shop near us for £20! A bargain if ever I saw one! It’s currently home to Ottilie’s collection of tractors, trucks, and diggers, because my goodness this little girl of mine is obsessed with anything on wheels right now! We’re planning on a trip to the London Transport Museum for her 2nd birthday in a couple of month’s time, which I think she’s going to adore! 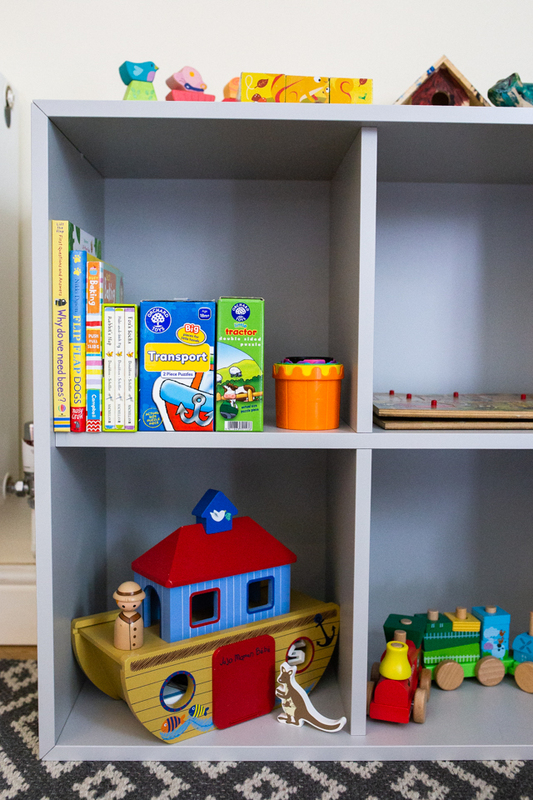 My main aim for the space was to have just a small selection of toys, laid out in an easily accessible and inviting way. Like basically other parent ever I ordered a set of the infamous IKEA Eket modular shelves, which, may I just say, I TOTALLY built all by myself and didn’t have any husband-input on. You can’t even imagine how proud it made me, especially being totally DIY-phobic and always keen to delegate boring jobs to Jason! ;) Ottilie was a great helper too! So cheap they may be, but I think the shelves look so great! 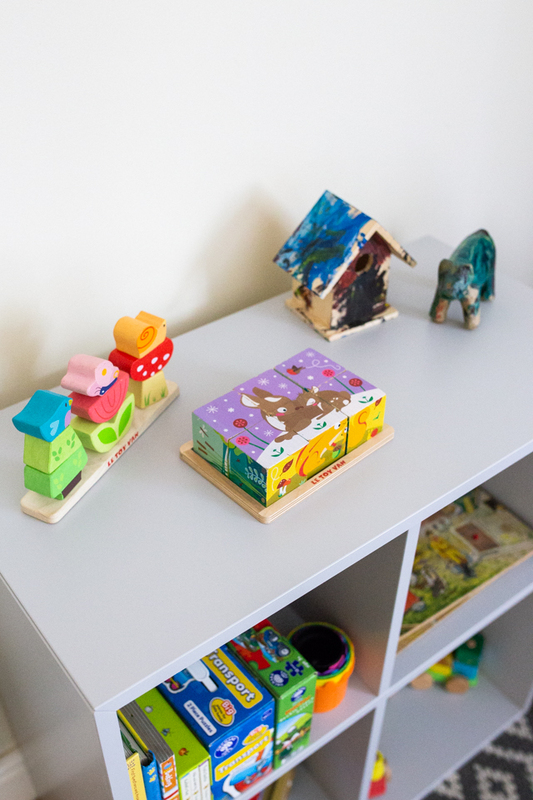 They’re just the right height for Ottilie to reach and take whatever toys she wants to play with from the top, and I find that since her toys, puzzles, and books are all out and visible and accessible, it seems to tempt her to play too. I’ve also made it a space to introduce some new and different toys, like her new boxes of puzzles! In the living room we have her toy kitchen and wooden tea set, babies, prams, and toys that in general invite more imaginary play. Since I knew this space would only be used for short bursts, I’ve filled it with toys that will absorb her attention fully but are things she tends to move on from fairly quickly. Like puzzles! Oh, and I’ve been using the corner as a place to display some of the bits that Ottilie’s painted lately, which I love! 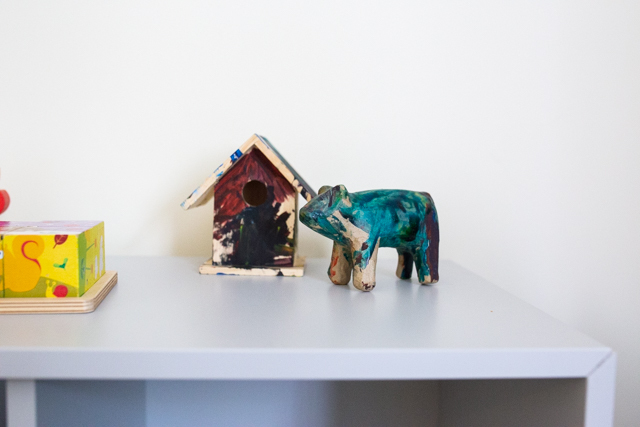 She’s especially proud of her little birdhouse, and likes to ask herself ‘Who painted dat?…Ottilie! !’ whilst showing it off! Last but not least is the rug! It’s from Next, and perfectly fit my criteria of having a dark pattern and being durable enough to withstand toddler spillages and muddy dog feet, but not look drab and boring! I’m so pleased with it, and think it’ll be a nice place for the baby’s bouncer and playmat to go come October time too. So that’s our new play area! You can’t imagine how happy it makes me seeing Ottilie enjoy the space, especially when it means I’m able to cook meals without a toddler sitting up on the worktop next to me throwing handfuls of salt/onions/pasta onto the floor at random! 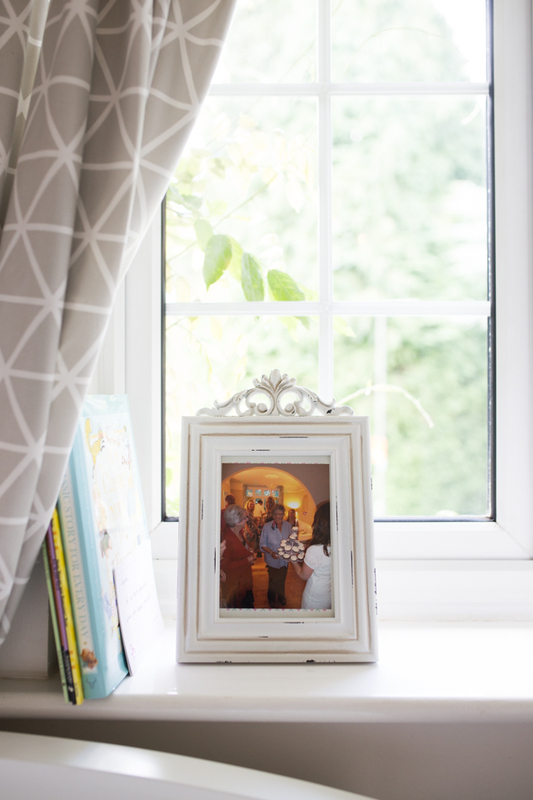 I’m on a bit of a mission to update parts of our home at the moment, so would you like to see more as I go? 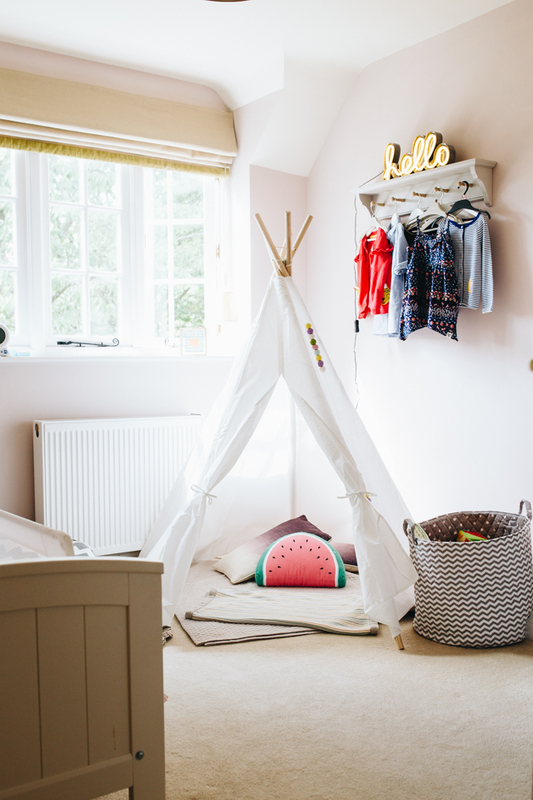 We’re almost finished sorting Ottilie’s bedroom (we’ve done a nursery to toddler room makeover lately, and it’s looking so cute!) and are about to tackle the spare room too! A tour of our nursery! 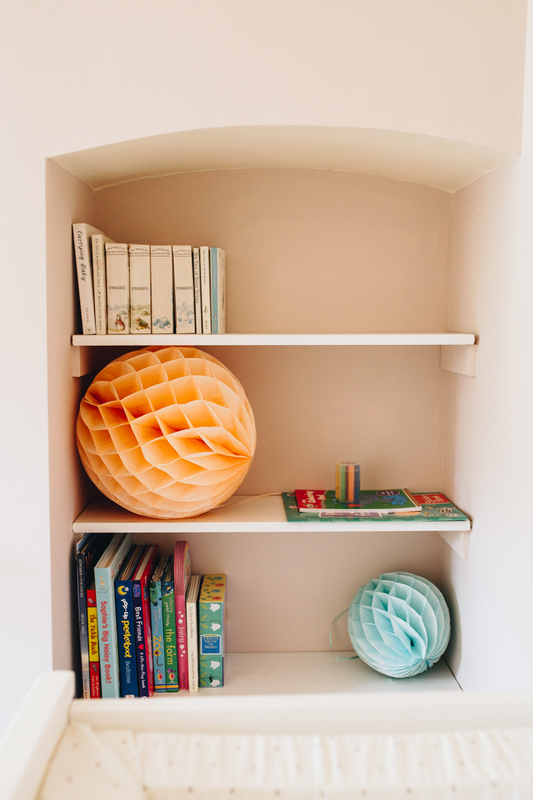 A G R E Y + P A S T E L B A B Y N U R S E R Y .
I’m so excited to finally be sharing photos of our finished nursery today! I’ve been working on this room for months now, and it’s been so much fun. Okay, the first part, where we had to clear out several years worth of clutter and dismantle a huge IKEA daybed and take endless bags of rubbish to the dump, THAT part wasn’t so fun. But getting to design this space from scratch, and give the room a proper purpose rather than it just being a place to put the laundry airers, and hide all the junk we were too lazy to deal with? It’s been the best! We wanted to create quite a classic and timeless feel in the room, one that we can easily adapt as the baby gets older. And since we don’t know whether I’ve got a baby boy or baby girl cooking right now, we’ve kept things totally neutral, too! 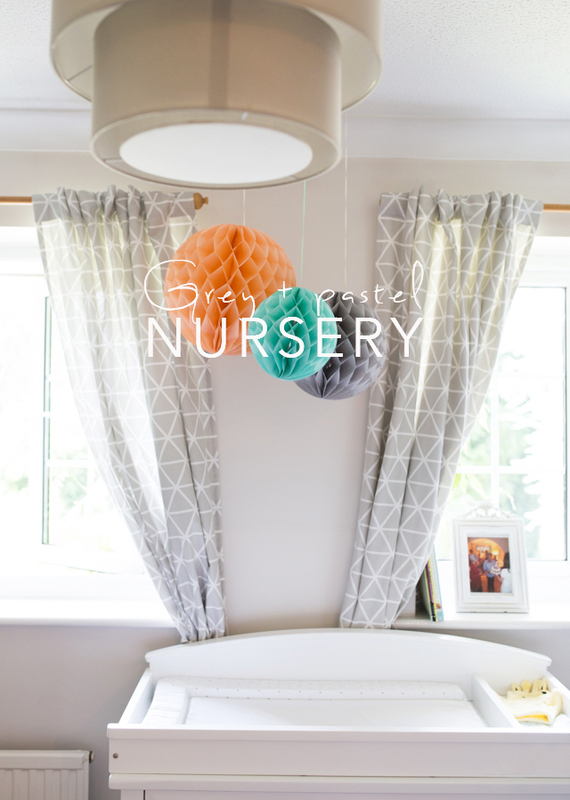 So, below are photos, links, and details of our nursery. I hope you love it as much as we do! Since the space we have to work with isn’t huge, we decided to go for lightweight curtains in a neutral colour- ones that wouldn’t sit too bold and heavily within the room. One of my favourite things about this room has always been how much lovely natural light it gets (and that creeping wisteria!) so it felt a shame to hang anything really heavy! We plan on getting some blackout blinds for when the baby is sleeping in the nursery on a nightly basis. 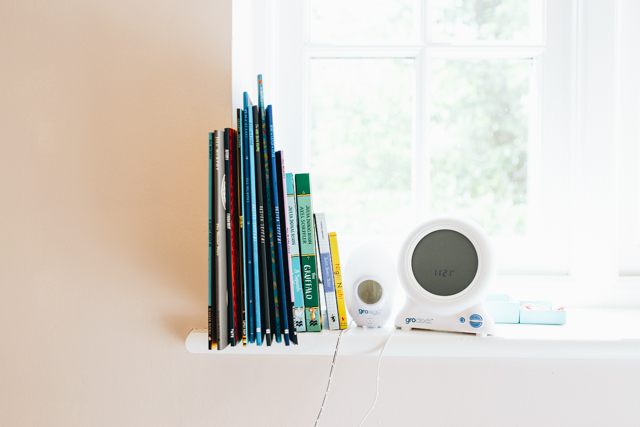 The little box above in the photo above has a few of the toys we’ve been kindly been given for this lucky baby, and the other end of the window ledge holds the start of baby’s library. A few of my favourite childhood stories, gifts from my Mum and sister! 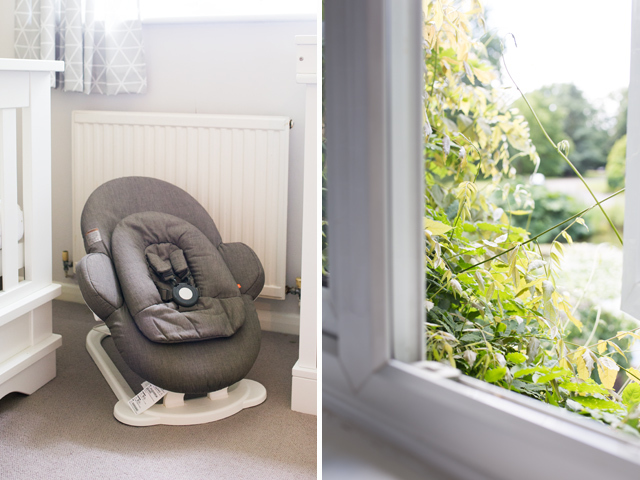 That far corner of the nursery also right now holds the lovely charcoal grey Stokke bouncer* we’re so excited to use! It’s ingenious in that it sits either free on the floor or clips onto the top of the Stokke Steps chair*, which we’ll have in our kitchen as a place for baby to sit or snooze (we hope!!!) whilst I’m in there cooking. The amount of love I have for this sweet little shelf is kind of ridiculous! Right now I’m using it more for decoration, as a place to hold some of the sweet books we’ve bought and been given for the baby, but it’s also a useful place to hang some of the larger items we’ve got (the snowsuit, and lovely hooded towel) that are a bit bulky for folding into drawers. I think it’ll come in handy too as a place for hanging winter coats and jackets as baby gets bigger, and for storage of the mountains of little toys I know we’re set to accumulate over the coming years! 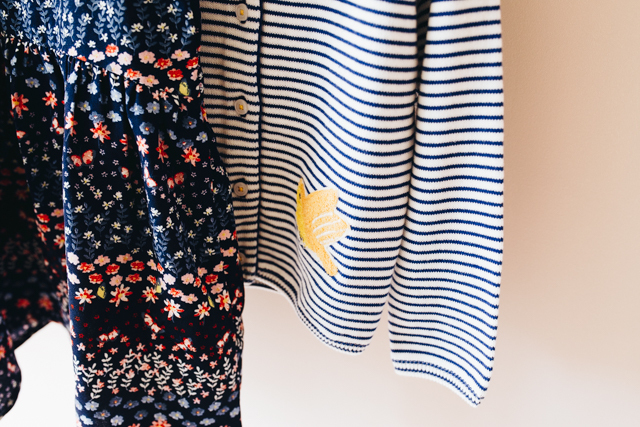 It’s from a little shop on Etsy called Furneco, and we’ve been thrilled with the quality. 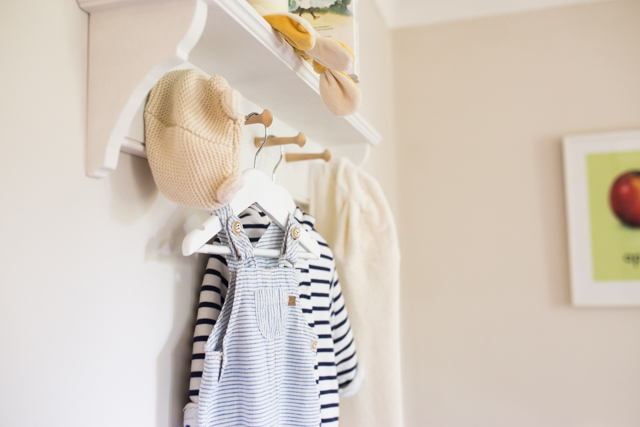 One of the main things we desperately needed for the nursery was a big dresser, since the only storage space in the room (a big mirror-fronted cupboard) is already absolutely full with mine and Jason’s coats, all our accounts and paperwork, toiletries, and piles of bedlinen and towels! 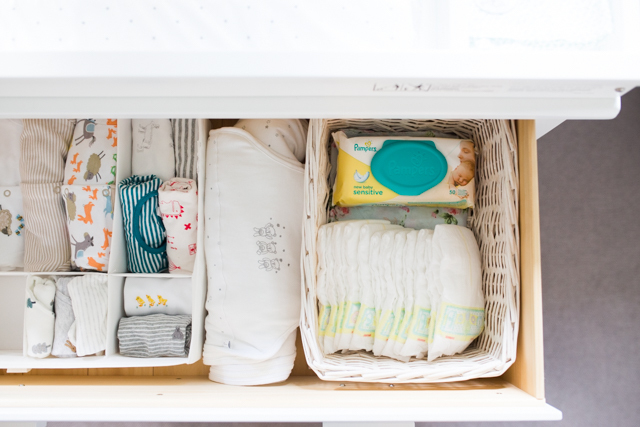 We ended up choosing this white three drawer dresser from Boori*, which acts both as storage and a changing table too. It’s such a beautiful piece of furniture (and matches our cot, which I’ll show you next up!) and the storage space it offers is amazing. 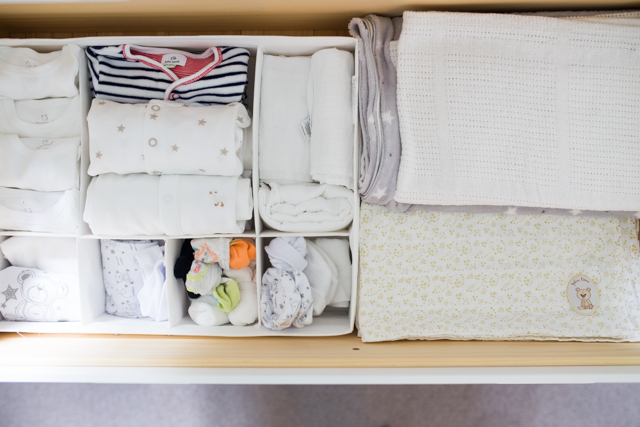 Now, I can’t lie to you- organising all the baby’s sweet clothes and things into those lovely big drawers has been so much fun! Since the drawers are so deep, I bought a couple of inserts from IKEA to keep all the little sleep suits, vests, and socks organised. 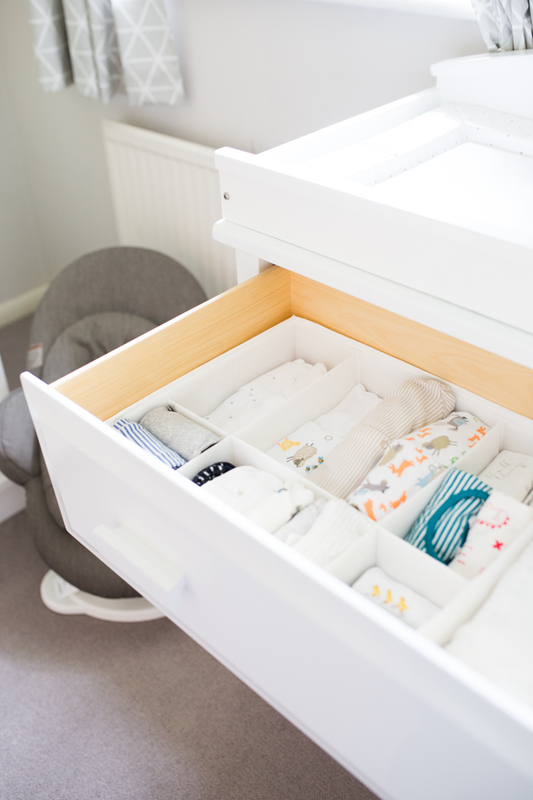 Right now, the top drawer holds newborn and up to 1 month clothing plus a basket for nappies and wipes (I’ve taken quite a few sleep suits, vests, and nappies out and packed them into our hospital bag, which is why it’s looking a little depleted! 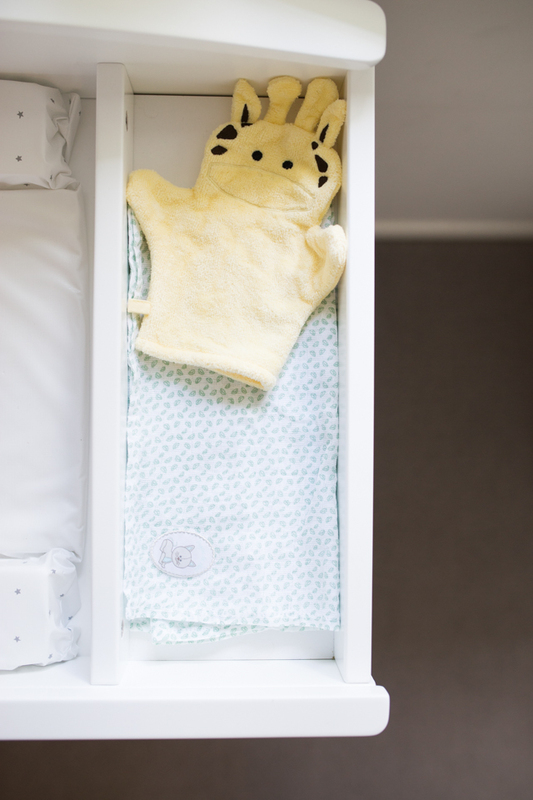 ), the second drawer holds clothes aged 0-3 months plus muslins, swaddles, blankets, and bed linen, and the third drawer holds towels and a few of the odds and ends we haven’t got use for right now, like the baby monitor! 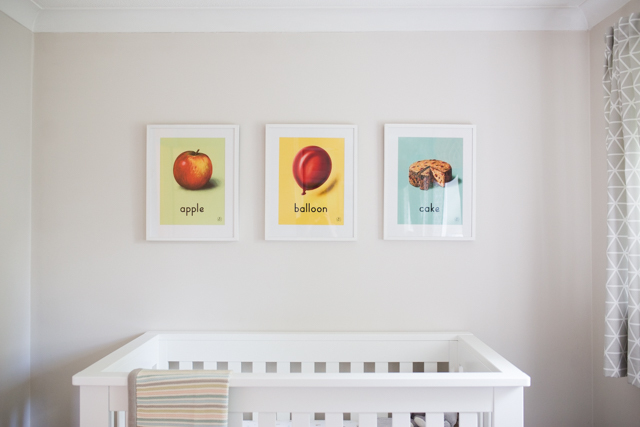 One of the things I was most excited about when it came to putting together the nursery was finding some beautiful prints to pull the whole room together! I knew I didn’t want anything that would look too ‘babyish’ and would need replacing in a year or so’s time, but I also wanted some prints that had a retro childhood kind of feel to them. 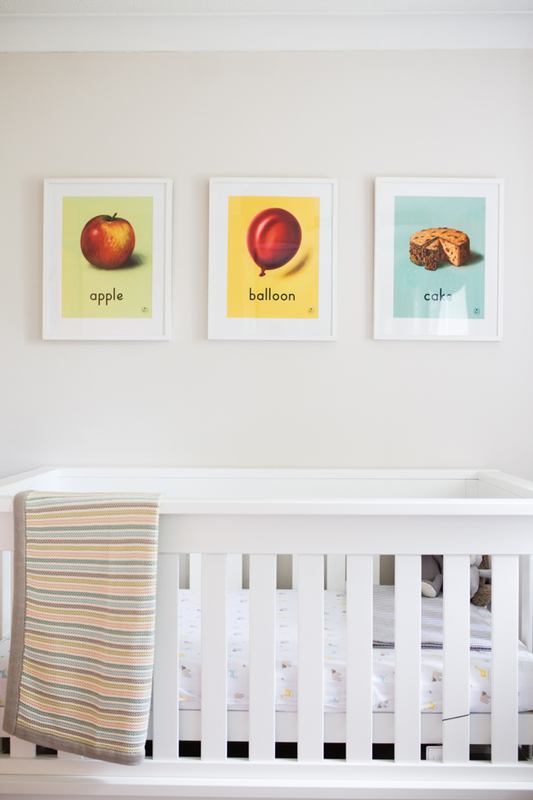 These three Ladybird prints (Apple, Balloon, & Cake*) matched my criteria exactly, and the colours happened to be exactly what I was after for the room too. Pastel shades, but still bright and fun! We decided to have quite big prints up on the wall above the cot to provide a big splash of colour, since the rest of the room is so soft toned and neutral. I’m thrilled with how they look! The cotbed we’ve chosen for our nursery is the beautiful Eton convertible*, which matches the dresser and changing table unit. 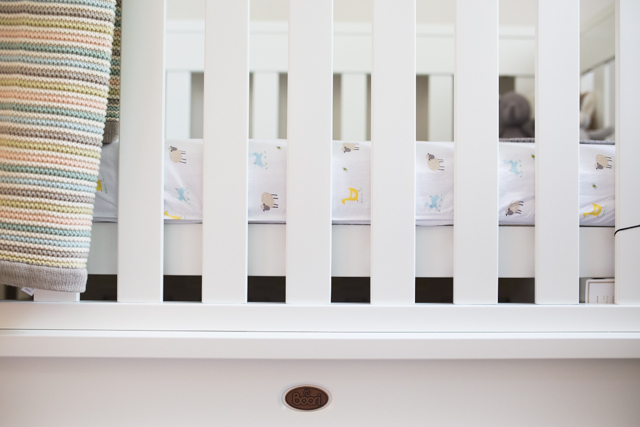 I love the very simple, classic style of the cot, AND the fact that not only does it convert to a cotbed that’ll last until baby is around four years old, but it also can be converted into a full double bed too! We decided to keep the cot free from any bumpers, and have just popped a few of baby’s little toys in the corner and a soft blanket or two in there for now. And that’s the nursery! We’re so thrilled with how it’s turned out- I kind of want to spend all my time in there now! A few of the items in this post were kindly gifted to us by brands, and so for clarity, I’ve marked those items with an asterisk.